If we were having coffee, I’d be drinking mine (Starbucks Breakfast Blend or Veranda with Italian Sweet Cream) from this “Warm and Cozy” mug. You see – I just received it as a special “just because” surprise gift from my daughter-in-law this past weekend. I came home from a day out to find this in our mailbox. 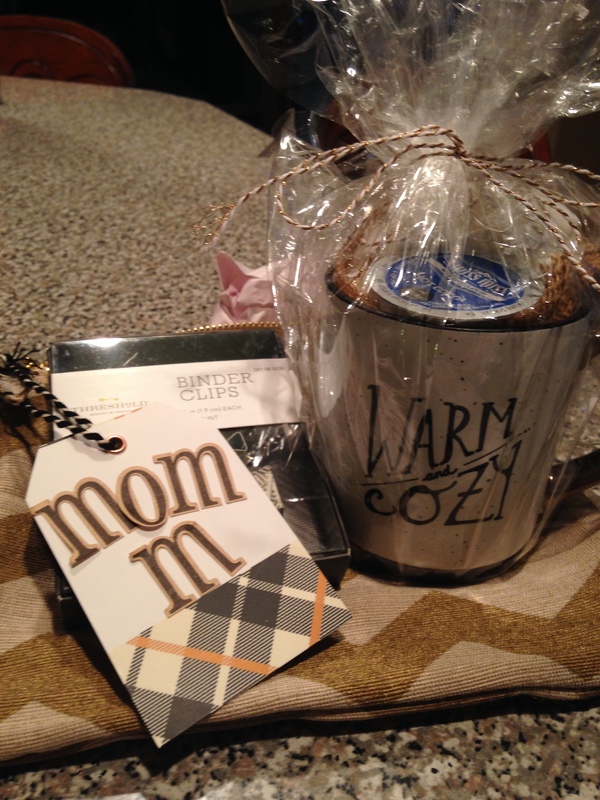 The mug was filled with Hot Cocoa K-cups and a little bag of mini marshmallows tied with gold and white baker’s twine. It was in an adorabl e chevron pencil bag and had some matching binder clips too. It melted my heart. So – needless to say, I would probably gush a bit about our sweet Colleen. I would undoubtedly offer you some cookies or whatever I had baked this week to go with our coff ee. Current batch of cookies in the house this week is Bittersweet Chocolate and Almond Chunk made from a Trader Joe’s Pound Plus Bittersweet Chocolate with Almond Candy Bar that hubby got as a gift recently (and I will be buying more of! O – M – G!) I coarsely chopped the candy bar and stirred it into my classic chocolate chip cookie recipe and Voila! We would either sit by a warm fire in the living room or at the kitchen table. Charlie would be laying on the floor beside us, watching for crumbs or waiting patiently for belly rubs and chin scratches. We might talk about the latest books we are reading. I am reading “Smoke Gets in Your Eyes & Other Lessons from the Crematory” by Caitlin Doughty. It is a fascinating memoir of a twenty-something who got a job in a crematory after college. She shares her experiences and how it actually eased her angst about death and dying and made her better able to appreciate and enjoy her own life. I am only a few chapters in, but I am fascinated so far and somewhat perplexed by mixed reviews I’ve heard from others in our book club who are reading it. Death is a topic I discuss daily in my full-time job in communications for a home health and hospice company, so it is not something I am as uncomfortable discussing as many. As a matter of fact, there is a 100% guarantee death is something we are all going to face, so it is a subject worth discussion. This might lead to us talking about hospice care and final wishes and experiences we’ve both had with losing special loved ones. This would ultimately lead to me talking about my Grandma, Grandpap, my in-laws, my sister-in-law – all very special people I have lost, but have fond memories of to share. We would surely laugh too, because they all brought such joy and fun to my life. We might talk about what we did last weekend. I would tell you what a fun time I had hiking around McConnell’s Mills with a sweet friend, about the awesome hot spiked cider we had afterwards at a local restaurant, and how we got recorded three times doing the “whip/nae nae” for a scavenger hunt while exploring a little gift shop after our hike. 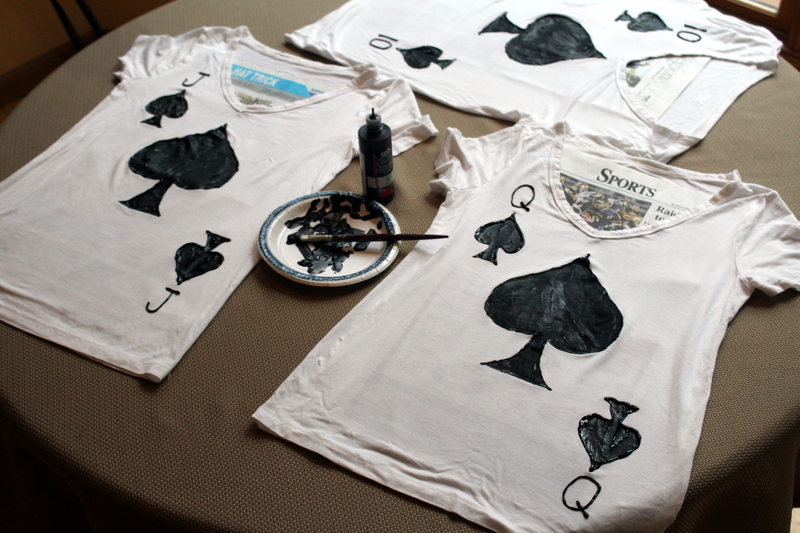 I might show you the t-shirts I painted for my youngest son and his girlfriend and their friends who are going to be a “royal flush” for a Halloween party in Chicago. I’d probably also tell you how proud I am of my oldest son, who had his first DJ gig this past weekend and how my younger son was there to help and support him. I’d tell you it warmed my Momma’s heart to think about them that evening. We might talk about the Pittsburgh Steelers’ win this weekend and how we did it with our third string quarterback. We’d probably also talk about the fact that we saw our first snow flurries in Mars this past weekend. Then we might talk about plans for the upcoming weekends. I might brag on my cousin Nikole Brugnoli-Sheaffer, Director of Innovation, Environmental Charter School, who is being honored as one of Pittsburgh’s 40 Under 40, a program to recognize 40 people under the age of 40 who are committed to shaping our Pittsburgh region and making it a better place for everyone to live, work and play. I can’t wait to honor her at the upcoming event. I would probably tell you I’m feeling sad that one of my besties is leaving soon to winter in Florida with her folks who she cares for full-time and how much I am going to miss her. But I would tell you my other bestie is going to be a first-time grandma in a few months and how excited we all are! I contest I am just truly and genuinely interested in people. As much as I love to talk, I adore listening. I treasure hearing about people and what matters to them and what makes them tick. Everyone has a story. And I love hearing them. We would surely cherish our time together, and we would undoubtedly hug. It would be a real hug, and I might likely tell you “I love you” when you leave, because if we are having coffee in my house, there’s a good chance that IS how I feel. Or maybe you are having tea if that’s your thing? And if it’s after 5…. maybe a glass of wine….. or two…. The sun was out, all,is right with the world…oh and possibly the wine 😊 A lovely post of sharing. And your day is ending as mine begins 🙂 Glad you had a good one. The sun is beginning to show signs of delighting the day here! Almost bed time. Nighty night! 7:30 am here and time to get the day going! OH what a wonderful way for me to start the day! This post made me feel so many warm fuzzies 🙂 I CANNOT WAIT for the day when we can share coffee together or maybe hot cocoa, you got me thirsty for that after that sweet gift from your daughter in law. What a nice surprise! Your heart comes out in this post and I know how much you really care about people and look forward to delight in sitting beside the fire with you! And definitely in getting to rub Charlie’s belly. Have a awesome day my friend as you cherish the moments!! ❤ and hugs! Great post, Jodi. I felt as if I was having a cup of coffee with you even though I don’t drink coffee…:) Your warmth shines through in your words, as does your interest and caring in others. Even though I have book I’ve yet to get to, you’ve piqued my curiosity with this book you’ve mentioned. I’ll have to pick it up one day soon. Oh George – thank you for your kind words! What book is on your coffee table waiting for you to read? Too many, Jodi…:) But on top I have the Ken Follett trilogy beginning with Fall of Giants. I also have a book called Empty Mansions. My brother gave me one called Hitler’s Charisma because I’ve never understood how one deranged man can lead an entire nation into distorted truths and hideous acts. I also want to re-read The Shadow of The Wind which may be the most beautifully written book I’ve ever read. It reads more like poetry than prose. And now you’ve given me one that I’m curious about. The winter’s coming. I’m guessing I might have some time.😊 So many books, so little time. I hear you, George – I too have quite a stack! What a lovely post Jodi. As I read it I felt myself slow down and melt into your words. I could picture all the faces of people you mention and all the warmth and love you have for them. Your book has also piqued my interest. I’m at that stage in life where I cherish every moment I have with my parents and Mother-in-law, and extended family. Thank you for such a thoughtful post. 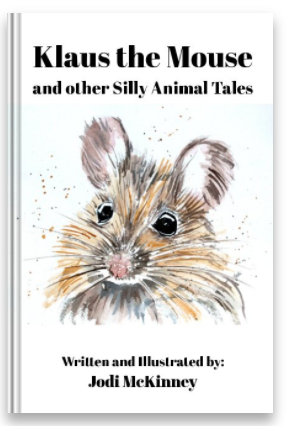 A warm and cozy post…..relaxed just reading it. I can imagine that your warmth pervades all your relationships and makes everyone cozy, Jodi! Awh! What a sweet thing to say! thank you, torrie. Love your photos of coffee, cookies, and t-shirts! It’s fall. Jodi, looks we have a lot in common. I’m headed to do a service today with one of my Tree’s of Life with the Palliative Care Department at UNC Hospital. I work closely with the Department of Pastoral Care and paint a lot of trees for the nurses to hang leaves on for patients they have lost. Unfortunately the trees fill up every year. For patients, families, and staff it is the process that is healing. For me, peace to paint a tree. Oh how wonderful Beverly! I am sure you will touch many lives today! Thank you for what you do!! Thank you for sharing the window into your life Jodi. I would say there is so much to be grateful for. I’m drinking my cup of coffee right now so cheers and gratefulness for our happy lives. Jodi, I loved this post. I would really love sharing a cup of coffee with you, it sounds delightful. Before I came to live in Pittsburgh (so very long ago) I had no idea what “nebby” means. I had never heard that word in my life. But now I do know (curious) and it made me smile to see you use it. Thanks for this post this morning. I feel like I just enjoyed a nice cup of coffee and friendship with you Jodi and the cookies were delicious! Hmmm, maybe I will… 😀 😀 (My life is boring). Haha! I guess you’re right but my story is boring. Hahaha! Jodi, I would love to have a cup of coffee with you! I have had two cups (1 over my limit, hot flashes). But for you, I’d have one more! Thanks for a warm and fuzzy post…in the midst of starting another day…this was a breathe of serene air! Thanks for sharing and slowing the pace. Yes death is a hard subject, but it also is inevitable. I lost some family this year and the latest is only a month ago. Very tender subject, but talking is also remembering and a another step going through the grieving process. We need to keep the great memories of our loved ones and tears are good. They are the rain in our soul. We can’t have rainbows without rain. Blessing to you for a comforting post today! Awh thanks CM – my day gets hectic too, but I like to cherish those relaxing moments. My heartfelt sympathy for your recent family losses. It is never easy. Allow yourself to grieve, and only time can soften the edges of that tenderness. You are so right that we cannot have rainbows without the rain. Thank you for your thoughtful and heartfelt comment. Wow – you must have a fun assortment if it makes you look forward to getting out of bed! 🙂 Love it! Oh Amy – Sending a hug and sorry to hear what you are going through. 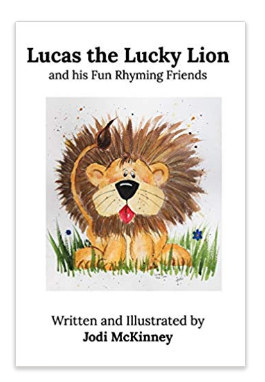 Not sure this book is the book for you and your family right now to deal with what you are going through. Here is a link to some resources I highly recommend though (for free to download) that may help you: http://www.celtichealthcare.com/hospice/palliative-care-journey-program/ The Journey GPS Guide is such a great tool for starting the conversation and having deep meaningful important conversations about what path we and our families choose for that journey towards end of life. It is a natural thing we must all go through and there are ways to make it better. If everyone is hanging on to last measures, a book that was very impactful to me was The Cost of Hope by Amanda Bennett and what she went through with her terminally ill husband. Another book I bought, but have not read yet, but I think will be good is Hospice Voices – Lessons for Living at the End of Life by Eric Lindner. You might want to look it up and see if it sounds good to you. I know the phrase “end of life” scares a lot of people, but we are all either there or heading there, so we must get comfortable talking about it and enjoying LIVING and LIFE even when it is at this end journey. Hope my babbling is making sense. Hugs and love! Definitely download the free Journey GPS (Getting Plans Started) guide – even if only for yourself to think about. Tight hugs! One day we shall have coffee in person friend!!! 😃❤️Loved this Jodi! And seriously those Royal flush costumes officially earn you the world’s coolest mom award!!! Love it! Warmest hugs and love for sharing the wonderful gift that you are. Right back at YOU Haunani! Thank you! I love your “if we were having coffee” posts because they are so honest and optimistic at the same time, and that’s not always an easy thing to combine! Thanks for the book recommendation, too. I’m going to check into that one! thank you for the kind comment, Ann! I sure appreciate! Wow the cookies sound yummy, have to look into that chocolate bar! the book sounds interesting not sure how I would feel about it. But as you said something we will all face at some time. What a sweet gift from your daughter in law. I would love a cup of coffee in a mug like that! you are a sweet and lovely lady and I would hug you back! Thanks! Just catching up on your week after a hectic week of my own! Would love to hear more about being recorded doing the nae nae! What a riot! Love love your blog, cards (which is what led me here in the first place long long ago), photos and your recipes! Your daughter-in-love is a darling. Loved having coffee with you! Awh thanks so much Laurie! I loved this post and commented but it might have gone to spam! hmmm. I’ll have to look – but thank you sweet Lynn! I found a few in Spam – thanks for mentioning that I should look. Found a few of yours and several others! There were 150 in there! EEKS! anyway – got through them – and thanks for your sweet comments my friend!! yes I have found tons of old messages from a month ago! thanks Jodi! I always love your blog and everything on it! thanks Lynn – and same with you and yours!